The Society was established in the year 1933 for the education, welfare and upliftment of women in and around Sangli, the southern most part of the Western Maharashtra, the first of its Kind. The Society made steady Progress over the years against many odds. However the break through came with establishment of college only for girls, in the year 1972. This was a novel idea and a maiden attempt. Of course, this was initiated at the pressing demand from the well wishers, students and parents. The college very soon came to be known as Smt. Mathubai Garware Kanya Mahavidyalaya, named after Shriman Abasaheb Garware's revered mother. Today the college has created a halo of glory all its own and so are the other units functioning under the society. Abasaheb Garware We have professional courses like B.C.A. and B.B.A. only for girl students. There are more than 7000 students studyng from KG to PG. Opens yet one more new avenue for the girl students in and around Sangli. 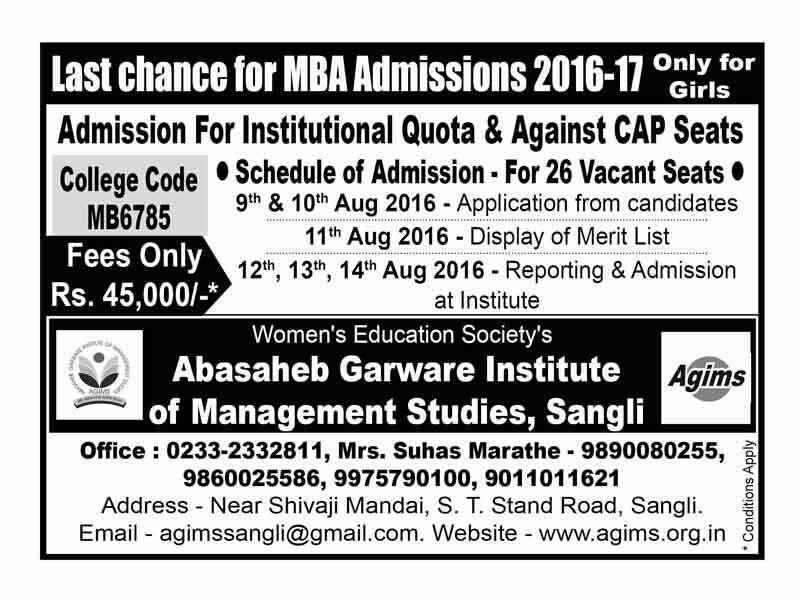 The Women's Education Society, Sangli has the great privilege of announcing the commencement of MBA programme from the academic year 2011-12. Mrs. Suhas C. Marathe, I/C Director.Phone No: 9890080255.